The Westfield name in retail is synonymous with prestigious properties that offer an efficient and dynamic environment for retailers and a quality shopping experience for consumers. With a portfolio of 104 shopping centers globally, Westfield is also a leader in ensuring the protection and safety of staff and contractors in back-of-house and operational areas using state-of-the-art security technology. With thousands of staff and contractors working in the centers across Australia, Westfield management identified a clear need for an efficient and secure system that would allow all workers safe and easier access to and from authorized center locations. To resolve this need, the organization implemented a pioneering key control and management solution with fingerprint biometrics. The system allows preapproved personnel more streamlined access to and from authorized center locations and provides management with comprehensive monitoring and report functionality. 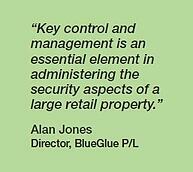 The solution, developed for Westfield by Blue Glue® and Morse Australia, is based on Morse Watchmans’ KeyWatcher® key control and management system, integrated with the NoWAIT (National Work Authorization and Induction Training) fingerprint recognition system. Enrollment in the system is through fingerprint identification; a one-time registration allows access at any site in the program with all access activity recorded for auditing purposes. The system additionally issues a durable identification wristband with name, date and time stamp. 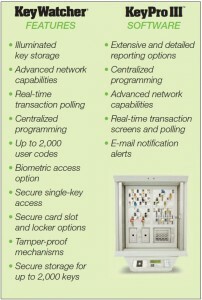 The Morse Watchmans KeyWatcher system stores and secures facility keys in a tamper-proof electronic cabinet equipped with an integrated fingerprint scanner and a large, easy to read display screen. Each key is locked into place inside the key cabinet using a locking device which has an integrated chip, so a user can only remove a key which he or she has permission to use. The other keys remain locked into place and in this way, the system automatically controls who is able to use which keys. The unique system, with its streamlined procedure for accessing keys, offers several advantages to users and management. For example, contractors, consultants and others will no longer have to sign in and wait for a key to be issued. 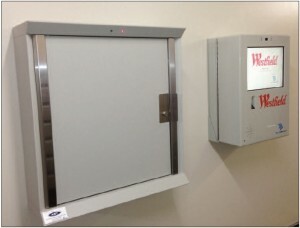 They simply place their finger on the key cabinet fingerprint scanner and when identity is verified, the cabinet can be opened to access a key. Emergencies that occur during off hours can be more readily acted upon because contractors can access keys without having to wait for property management to arrive on scene.With real time tracking and reporting functionality, management will always know who has accessed keys and when. Proof of concept trials were performed at four Westfield Shopping Centers in the Sydney area and, based on their success, the program was rolled out on a national basis in early 2013. Westfield Shopping Centers anticipates many more stores will be added to the system in the future.